Welcome back to Tripawd Tuesday! 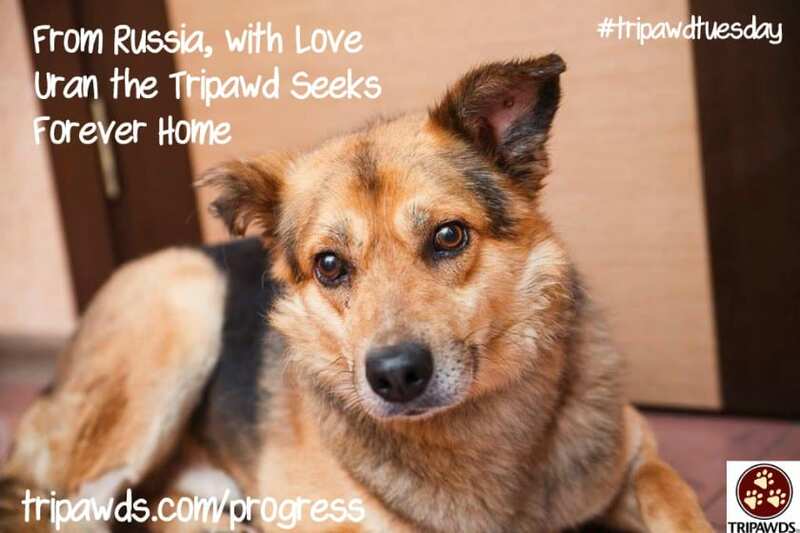 We are kicking off our newest Tripawd hero spotlight, with a special dog rescued from Russia. He is currently being fostered in Pennsylvania, and would love a forever human to call his own. Read on to learn more about this special adoptable Tripawd. We learned about handsome Uran from Tripawds member Debbie, mom to Angel Patches. The organization fostering Uran is very near and dear to her heart. Here’s what she told us about this lovely boy who was rescued by Dire Straits Paws Rescue Team. Uran is young, healthy and VERY friendly to everyone. He won the title of Mister Kindness in every vet clinic where he was staying before the decision to amputate his paw was taken. He is friendly to everyone. He suffered enough because of human cruelty, his paw and a hip were broken, he has several bullets in his body, a teared apart ear BUT he is still having a super kind, lovable and nice personality. He is a perfect dog for a family with kids, other dogs, cats…he is perfect in every family. Not a barking type, calm and very obedient, totally housebroken. He would make a great family dog. Vaccinated up to date (the medical records will be provided). We can deliver to other states (he is currently in PA foster home). Please contact us via email or visit Dire Straits Paws Rescue Team on Facebook if interested!